'Discover Diablo' during the year ahead, from the geology to the wildflowers to the critters that call it home. PLANNING YOUR NEXT 12 MONTHS... around the chance to join a monthly guided hike in some of the most splendid countryside to be found anywhere? Guided hikes that cost nothing to join, and will include closer glimpses of petals and beasties and fascinating geological features? It seems a natural thing to do at the start of the year, as natural as going through your sock drawer to make sure every stand-alone has its all-important twin and finally investing in a yoga mat that is as squishy as you like it. 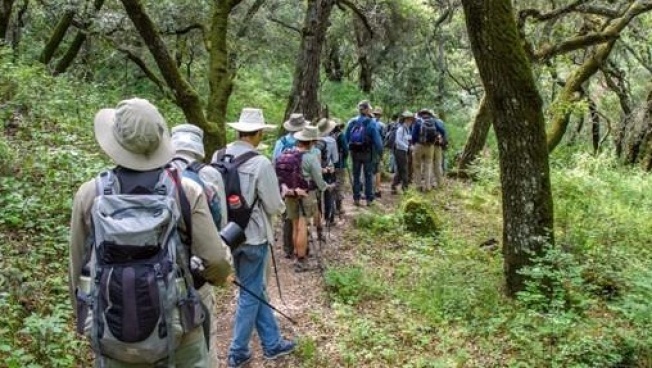 We all have our year-starting rituals, of course, and for those people who dig amazing birds and scurrying tarantulas and the vast unspoilitude of Mount Diablo, the year begins when the line-up of free guided hikes is thoroughly perused. And peruse you can, now, this instant, for Save Mount Diablo has posted the Discover Diablo outings for 2018. They're happening twice each month, with one hike each month "...focusing on a specific piece of land Save Mount Diablo owns and stewards," while a different hike will be created for families (those'll come with a theme, perhaps, or "...will highlight ecologic features"). ON THE UPCOMING CALENDAR? Grab your beloved pair of treads, your water bottle, your brim-iest sun hat, and get to daydreaming, for you just might be roaming Madrone Canyon on Jan. 27, savoring a wildflower saunter at Mitchell Canyon on April 14, taking in Mangini Ranch by night on June 9, or joining a Halloween hike of Black Diamond Mines on Oct. 27. We typed "or" in that last sentence, as if you don't want to do jump into all of those happenings, and the others listed on this page. Shell Martinez Refinery is the sponsor of the free hikes, which do require the whole RSVPing thing, so don't dally on that, should you fall in love with the notion of spying tarantulas around Mitchell Canyon on Sept. 29, those multi-legged roamers as they search for mates. Yep, we mentioned "scurrying tarantulas" several sentences ago, so it was pretty much guaranteed we'd return to that tantalizing topic before the end of this post. Need more tarantulas, more wildflowers, more Diablo-o-sity? Hike over here.